You’re considering, or have purchased, your ideal computing solution with one of NextComputing’s portable workstation, rugged portable, or rackmount platforms based on our flexible system architecture. Now, you are thinking about how you might further enhance your business by extending your toolset or expanding the offerings to your customers. That’s where NextComputing’s common architecture comes in. Although we offer many different form-factors, we have designed all our products using a modular, enterprise-class architecture that allows us to easily deploy your application on multiple types of systems that share common elements. 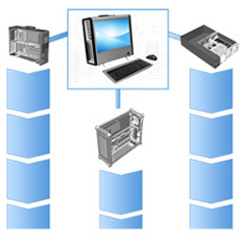 Do you want to offer your solution in both portable and rack-mount systems? Do you have a customer that likes your portable product, but needs something more rugged for use in a harsh environment? Do you need fast hardware upgrades across your entire line of products? With our modular design approach you can avoid time-consuming re-testing on new hardware platforms, letting you introduce new products to market quickly and creating an entire family of products to suit your various customers’ needs. Contact us to learn more about our flexible, modular system architecture and how it can help you grow your business.